Water has a power that is magical...with a natural ability to draw people to it. For over 25 years Oceanis has been 'creating with water' for leisure, entertainment and science. We combine the arts and disciplines of architecture, engineering and business to design, build and operate facilities around the world fo​r people: to work and play. Entertainment precincts, aquariums, leisure projects, marine parks, zoos, resorts, maritime projects and marine research facilities; we help our clients create experiences that are exciting, inspiring and that differentiate. We know that it takes more than just interesting design and good customer service to make a facility successful. 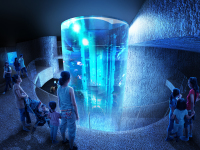 Rather, it is a deep set of multi-disciplinary skills, across a broad set of design and operational aspects that is needed for a successful attraction - to encourage visitors to stay longer and return more often. Oceanis blends creative and technical know-how, working closely with our clients to help create exceptional facilities. It’s the art and science of water. Oceanis' work on more than 300 projects around the world means we understand the latest in water based entertainment, current approaches to research, environment and sustainable practices, management and operations. Through our experience we have insight to real and current capital and operating costs. We bring this know-how to our planning services; masterplanning, feasibility studies, detailed cost analysis. It takes experience to balance creative design with technical and economic realities. Our multi-disciplinary team has a 25-year track record in designing water environments: leisure and resort facilities, pools, zoos, aquariums, large-scale mixed-use integrated attractions and cultural and science centres of every scale. Our international experience has given us the skill to create amazing environments that are relevant to their locale, yet globally sophisticated. Operations personnel with curatorial and commercial expertise – who know what works technically to keep animals alive and what works financially to make attractions successful – are sought after around the world. Oceanis provides this unique expertise, helping our clients manage and operate facilities with success.